Worn hands free, The Link Leash crosses your body like a seatbelt and positions your dog at your side. Connect the snap hook on the long leather section to the O-ring and connect the hook on the short leather section to your dog’s collar or harness. Wear The Link Leash over your shoulder and across your body, like a seatbelt. Unlike other hands free leashes, it’s easy to slip The Link Leash over your head to give your dog a little more space to take care of business or take in an interesting smell. Slip back on and you’re ready to continue hands free! The Link Leash can also be used as a traditional 6 foot hand loop leash by simply unhooking the snap hook from the O-ring and attaching it to the D-ring. You’ll love the feel of the soft, supple Latigo Leather, often used to craft fine quality horse reins! Similarly, if you are working on training and need a shorter leash, just feed the snap hook through the O-ring and then connect both hooks to your dogs collar, creating a 3 foot training leash! IDEAL WAYS TO USE YOUR LINK LEASH! Besides being the best hands free leash on the market, your Link Leash can also be used in many other ways! 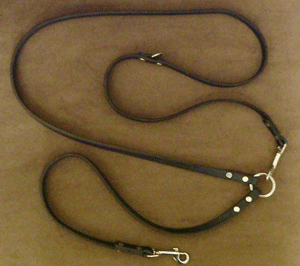 As a training leash. . . The Link Leash is also great for encouraging the “heel” position! Worn hands free, The Link Leash crosses your body like a seatbelt and positions your dog at your side. If the dog pulls, corrections are easy with a backward motion of your hand against the leash. If your dog falls behind, a quick forward push on the leash reminds the dog to stay with you. The Link Leash is recommended and used by professional dog trainers! If the dog pulls, corrections are easy with a backward motion of your hand against the leash. If your dog falls behind, a quick forward push on the leash reminds the dog to stay with you. The Link Leash is recommended and used by professional dog trainers! As a traditional leash . . .
Connect the hook on the long leather section to the D-ring to make a hand loop. To use with two dogs . . .
Feed the long end through the O-ring, hook each end to your dogs’ collars and hold the leash in the middle. For a temporary tie-out . . .
Wrap the leash around a tree or a post and connect the hook to either the D-ring or O-ring, depending on the size needed. Do not leave your dog unattended while tied out. As an aid in stressful situations . . . If you encounter a difficult situation, like dogs barking behind a fence, agitating your dog, The Link Leash makes it easy to keep your dog close and under control. A traditional hand loop leash allows your dog to “yank your arm out of your socket”. The Link Leash uses your entire body to steady you against a sudden lunge. If you know you are entering a situation where your dog may lunge, grab the leash and hold your dog close in the heel position – definitely easier and more effective than hanging on to a hand loop leash or a flexible length leash!! For personal convenience . . . If you are stopping for lunch on your hike or popping into the convenience store for a coffee, it’s easy to use The Link Leash as a temporary tie out! Just unhook the snap hook from the O-ring, wrap the leash around a tree or post, and hook to either the O-ring or the D-ring, depending on the size of the post. As an impromptu way to walk two dogs . . . If you are watching a friend’s dog or come across a lost dog on your daily walk, The Link Leash is ready! Just unhook the snap hook from the O-ring, feed through the ring, clip the hook to the other dog’s collar, and you have a double dog leash!